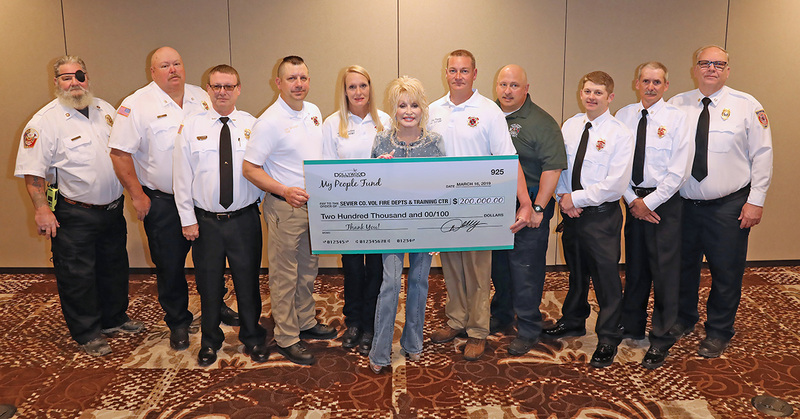 Dolly Parton’s My People Fund presents final checks to families and makes a long-term investment in future recovery efforts! In addition, Dolly’s My People Fund launched a partnership with the Mountain Tough Recovery Team to continue supporting these families in the coming months by providing $3 million for this effort. 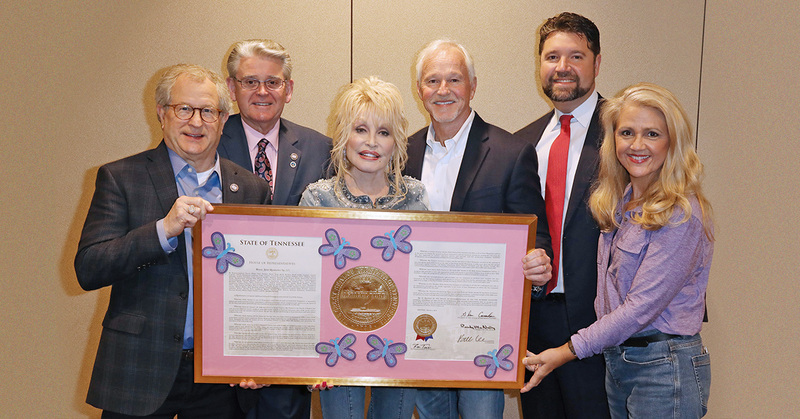 Dolly made this announcement during a special media event at Smoky Mountain Adventures in Pigeon Forge, TN, on May 5. Additional contributions, outside of the My People Fund, helped establish and support the Wildfire Scholarship Fund. Thanks to these efforts, every high school junior and senior in Sevier County, whose homes were destroyed by the fires, will receive a $4,500 scholarship. Today, recovery continues and rebuilding efforts are underway for the people who are and forever will be, Smokies Strong. My People Fund from Official Dolly Parton on Vimeo. 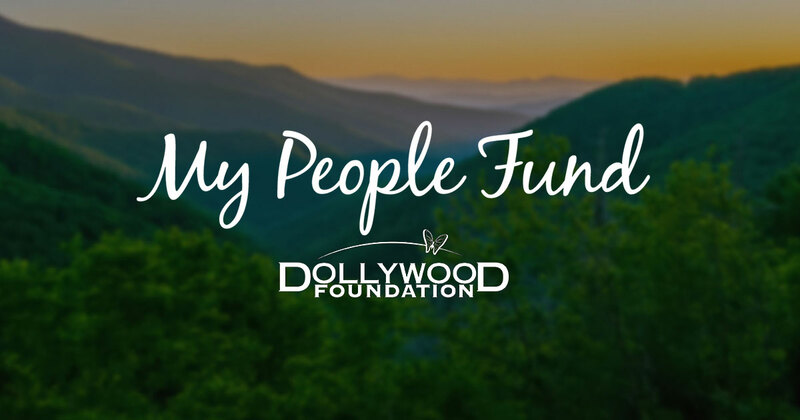 The Dollywood Foundation’s My People Fund provided $1,000 each month for six months to Sevier County families whose homes were uninhabitable or were completely destroyed in the Smoky Mountain wildfires. Any family who lost their primary residence (renters and homeowners) due to the wildfires in Sevier County were eligible. The mission of the Mountain Tough Recovery Team is to assist individuals and families recovering from the 2016 wildfires in Gatlinburg and the surrounding Sevier County area to rebuild and provide resources for other unmet needs for both homeowners and renters impacted by the fires. Devastating wildfires claimed the lives of 14 people and destroyed thousands of homes and buildings in Sevier County, TN, on November 28, 2016. The Dollywood Foundation’s My People Fund served nearly 900 families in the first distribution as donation totals climb to $9.3 million including $250,000 from Food City. The next distribution is set for January 26 and 27, 2017, at the LeConte Events Center in Pigeon Forge, Tennessee. Food City designated $500,000 to benefit the Gatlinburg Relief Fund, while the remaining $250,000 was directed to the My People Fund. The Dollywood Foundation’s My People Fund provides $1000 each month to Sevier County families whose homes are uninhabitable or were completely destroyed in the recent Smoky Mountain wildfires. Any family who lost their primary residence (renters and homeowners) due to the wildfires in Sevier County are eligible. A pre-application for those affected is available at DollywoodFoundation.org. Dolly Parton and a host of artists and celebrities took to the airwaves on Tuesday night during Smoky Mountains Rise: A Benefit for the My People Fund. They had one goal in mind, to raise funds for the victims of the Tennessee wildfires. The three-hour star-studded event was packed with beautiful performances, emotional stories and a collective message of hope. Viewers pledged their support by calling, texting and going online to DollywoodFoundation.org. The night’s performances included songs by Dolly Parton, Kenny Rogers, Hank Williams Jr., Chris Stapleton, Reba McEntire, Alison Krauss, Michael W. Smith, Chris Janson, Big & Rich, LOCASH, Chris Young, Montgomery Gentry, Jamey Johnson, Cyndi Lauper, Don McLean, Amy Grant, Alabama, Aaron Lewis and Rhonda Vincent. The heroic efforts of the first responders were celebrated during the live telecast. Also, viewers were reminded of Sevier County’s world-famous hospitality and renowned entertainment venues ready and waiting for them in East Tennessee. Dolly encouraged people to visit Sevier County and the Great Smoky Mountains. Tennessee Governor Bill Haslam and First Lady Crissy Haslam made a special appearance, and several celebrities greeted viewers in heartfelt video messages including Katy Perry, Carrie Underwood, Larry King, Steve Harvey, Good Morning America’s Robin Roberts, Kiefer Sutherland, and Today Show’s Willie Geist. Dolly shared her hosting duties with friends HLN’s Robin Meade, GAC’s Suzanne Alexander and Nan Kelly, The Bobby Bones Show’s Bobby Bones, SiriusXM’s Storme Warren, Crook & Chase hosts Lorianne Crook and Charlie Chase, NASH Nights LIVE’s Shaun Parr and Elaina D. Smith, and TuneIn Country Roads’ Kelly Sutton. Celebrities donating their time to answer phones included: Paula Deen and her sons Bobby and Jamie, Chrisley Knows Best cast members Todd, Julie and Savannah, Moonshiners’ cast members Mark and Digger, Nashville’s Charles Esten, cast members of Dolly Parton’s Christmas of Many Colors, country hit-makers Chris & Morgane Stapleton, Terri Clark, Mark Wills, Lee Greenwood, Larry Gatlin, T.G. Sheppard, Highway 101’s Paulette Carlson, John Conlee, Ronnie McDowell, Kristian Bush, Tim Rushlow, T. Graham Brown, Dolly’s nieces Rebecca Seaver and Danielle Parton, bluegrass hitmakers Lorraine Jordan and Darrin Vincent, comedian Henry Cho, KC of KC and the Sunshine Band, hot new country artists Brett Young, Cassadee Pope, RaeLynn, Danielle Bradbury, Lucas Hoge, Denny Strickland, songwriter Becky Hobbs, and members of the Tennessee Titans. Nearly $500,000 of donations were committed before the Smoky Mountains Rise telethon began. The ACM donated $100,000 to the fund, with Taylor Swift matching the amount, while the CMA donated $125,000 accompanied by a matching donation by East Tennessean Kenny Chesney. More than 1300 families have been displaced due to the wildfires which spread across Dolly’s home area of Sevier County, Tennessee in late November. The entertainment icon established the Dollywood Foundation My People Fund to provide $1000 each month for six months to every family who lost their primary residence. Currently, the monthly pledge is in excess of $1.3 million each month. On Nov. 28, devastating wildfires burned some 17,000 acres in the Great Smoky Mountains National Park. The fires also affected parts of Gatlinburg and Sevier County, TN. Sadly, 14 people lost their lives in these terrible fires, and over 100 confirmed injuries were reported. Over 14,000 people were evacuated during the fires which damaged or destroyed more than 1,700 structures (homes, businesses and churches). In Gatlinburg alone, officials estimate the wildfires caused more than $500 million in damage.